We are excited to provide you with a new way to monitor product updates. Check out the Dearborn Bulletin to view newly released and discontinuing products! 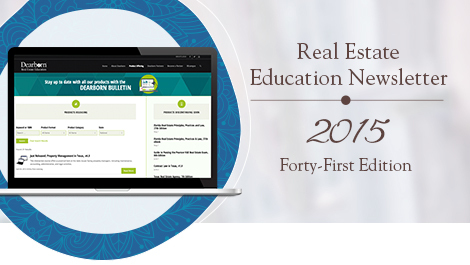 We are constantly updating our content to remain current with the evolving real estate industry. The Dearborn Bulletin is designed to provide a quick snapshot of products just released for sale and products we plan to discontinue in the near future. Keep your students ahead of the curve by keeping your courses up-to-date with the most recent versions. Help your students relay the most relevant information to their clients, provide them with an enhanced student experience…and see more students recommending your courses and school. Complement the Real Estate Fundamentals textbook with the Study Guide for Modern Real Estate Practice. With hundreds of questions and answers, this study guide reinforces important concepts and provides an alternative source for review while students work with the textbook. The inside cover of the Study Guide for Modern Real Estate Practice provides a quick and easy reference for using it in conjunction with Real Estate Fundamentals. The REEA 2015 Annual Conference is quickly approaching. Get a sneak peak of the 2015 Annual REEA Conference! Join Steve Harney for a preview of his opening session topic, How to Build a Speaking Business by Becoming an Expert in a Small Industry Niche. Karel Murray, CSP, DREI and Julie Garton-Good, DREI, CDEI will discuss two different Instructor Development Workshops. We look forward to seeing you June 18-22 in Connecticut for the 2015 REEA Annual Conference! Visit us at the Welcome Reception hosted by Dearborn Real Estate Education and stop by the Dearborn booth during the conference. For more information, view the conference video or click below to register. We are pleased to announce the release of the 2015 Educator’s Guides for Connecticut, Illinois, Maryland, New York, Pennsylvania, and Virginia.